This must be the #1 all time classic kids meal. 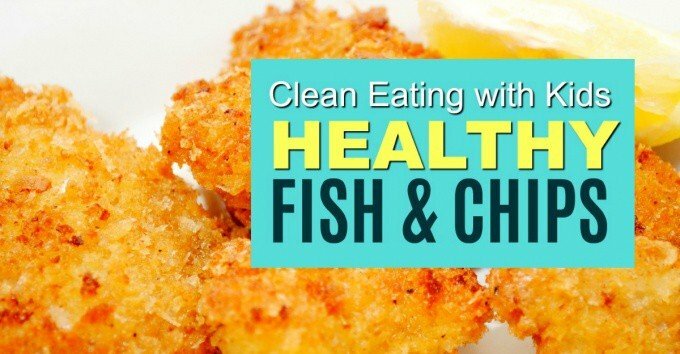 With a little clean eating makeover. 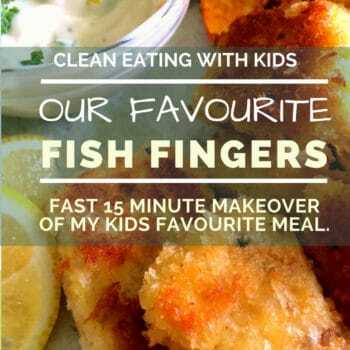 This is my clean eating version of most kids favorite dish – Fish fingers. 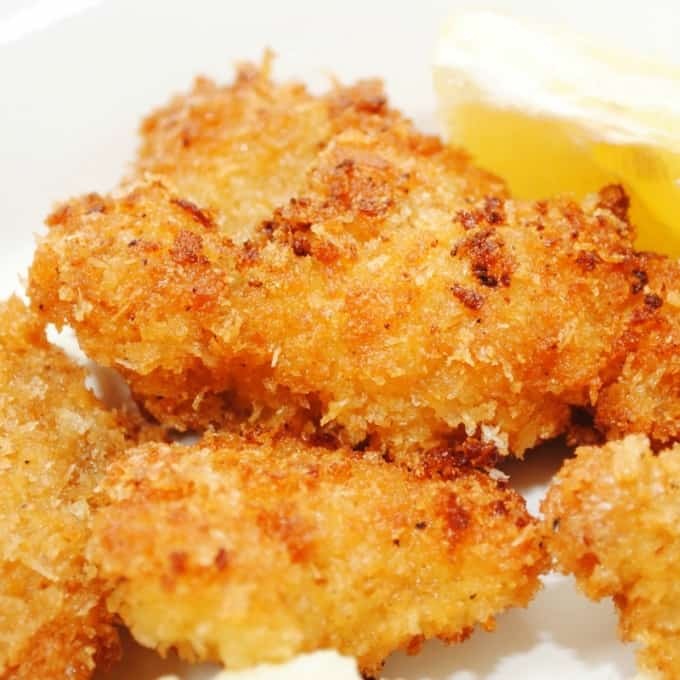 Hot, cold, on their own, in a wrap or part of a meal, these golden and crispy fish nuggets are made with real fish fillets, panko breadcrumbs and egg. Super simple! I’m not a good fisherman. Actually. I think it’s time to admit it. I don’t fish. At all. I’m OK up until the time that I actually catch a fish. The kids name it. I feel sorry for it. Then I let it go. Then my husband gets upset. Then we come home. Without fish. This sums up many a family fishing trip. My husband and two of the four kids love to fish and we have an amazing fishing spot about 8 minutes from home (don’t tell anyone coz’ apparently fisherman like to keep their spots a secret). So we are pretty lucky to have fresh fish for dinner most of the Summer. To keep my marriage intact and my freezer full of fish, I let my husband do all the fishing. He isn’t complaining though. Quiet time on the boat. Only two kids. And I’m happy about it. The man is seriously blessed I tell ya. 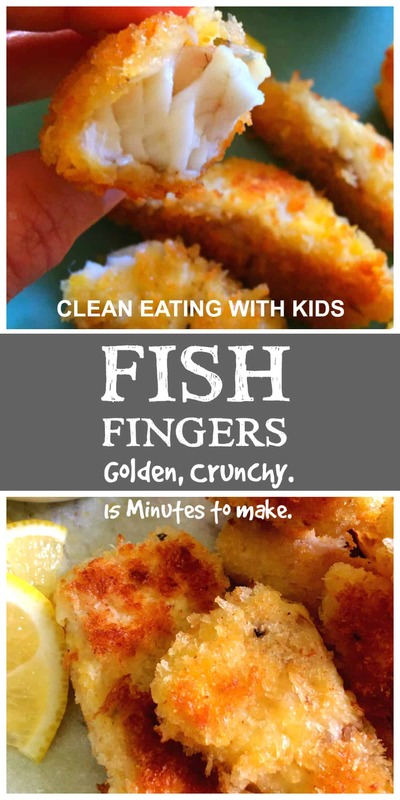 When my kids were little (aka pre-clean eating days), I would buy bountiful boxes of fish fingers. The dodgy ones. The premade 40 in a pack, not sure how much fish is actually in it, kind of fish fingers. But then I figured out how to make them. These crispy, golden fish nuggets are actually ridiculously easy to make at home and take about the same amount of time to cook. I can’t even call it kids food anymore. These are a delight that any adult would happily devour. I know. Because I do. This recipe only uses 5 ingredients, so nothing complicated. I use Panko bread crumbs. You can get them in almost any store and when you compare the ingredients list to that of standard breadcrumbs, you will see why I use them every now and again in my clean eating plan. ‘Fish and Chips’ wouldn’t be the same without the ‘chips’ part of the meal. 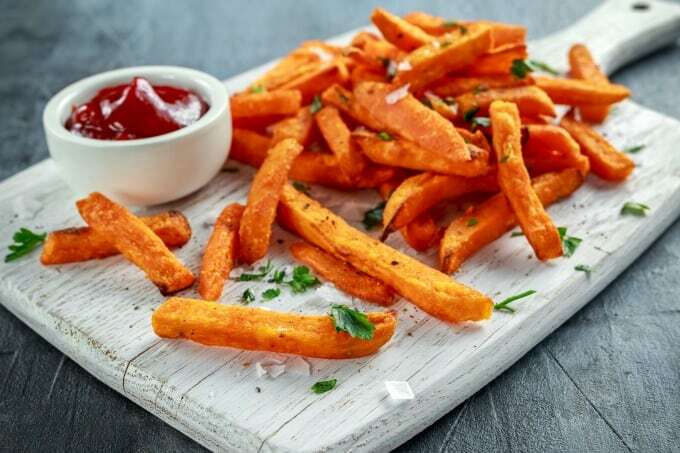 Keep it healthy by oven baking your own using regular potatoes or sweet potatoes. Just add a little olive oil, salt and bake for 20 – 25 minutes until they start to crisp. Serve it all up with some all natural ketchup and fresh lemon slice. OK, so maybe I’m giving away my age here, but when I was a kid ... (don’t all the best stories start with this) ... we would order fish and chips from the local takeout and get it served wrapped up in yesterdays newspaper. You got dinner and a read. If you were really, really lucky – you got the page with the cartoons. Anyway. They don’t do that anymore. Apparently it’s a hygiene thing. Which makes sense, but if you are willing to overlook the germ thing (and I know a lot of you may be squirming at this, so just skip this bit), maybe give the kids a taste of the good ol’ days and serve them their fish and chips dinner all wrapped up in yesterdays news. Preheat pan on stove top. Cut Fish Fillets into 1/2 inch strips (or bigger if you want thicker fish fingers). 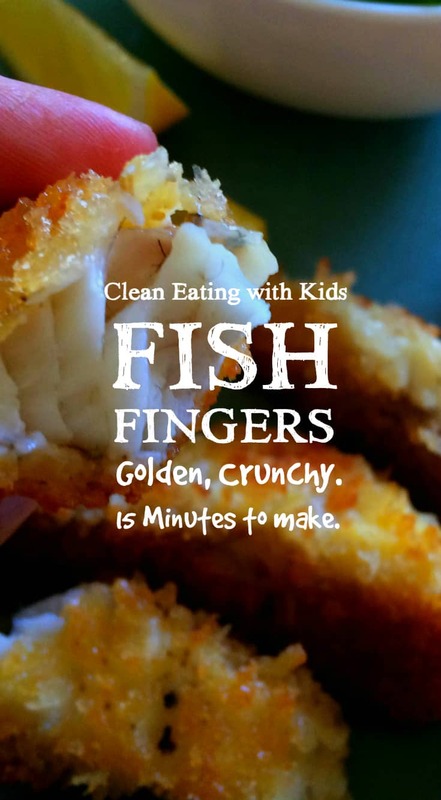 Each fillet makes 6 – 8 fish fingers in our home. Dip the fish in egg, then in crumb. 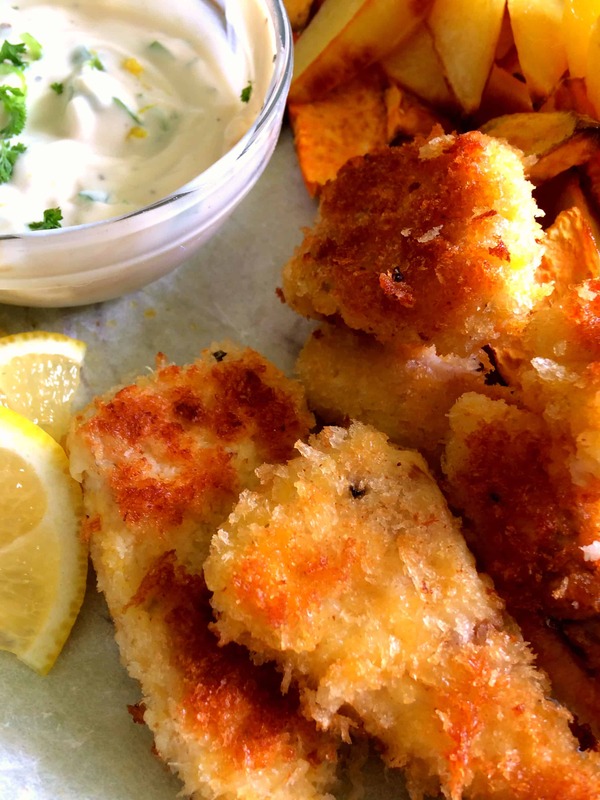 Place crumbed fish in hot pan and fry for about 2 min a side, until golden. Serve with fresh lemon, oven baked chips and fresh salad.